Bluefish (Pomatomus saltatrix) are a migratory, oceanic species found throughout the world in most temperate, coastal regions, except the eastern Pacific. Bluefish migrate seasonally, moving north in spring and summer as water temperatures rise and moving south in autumn and winter to waters in the South Atlantic Bight. During the summer, concentrations of bluefish are found in waters from Maine to Cape Hatteras, North Carolina. In winter they tend to be found offshore between Cape Hatteras and Florida. Bluefish generally school by size, with schools that can cover tens of square miles of ocean, equivalent to around 10,000 football fields. Bluefish are fast growers and opportunistic predators, feeding voraciously on almost any prey they can capture. 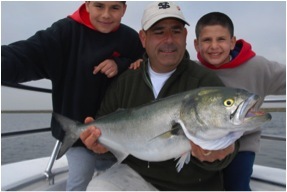 Bluefish live up to 12 years and may exceed lengths of 39" and weights of 31 pounds. Bluefish reach sexual maturity at age two and spawn offshore from Massachusetts through Florida. Discrete groups spawn at different times and are referred to by the season in which they spawn: the spring-spawned cohort and the summer-spawned cohort. Recent research has also identified a fall-spawned cohort, demonstrating an expanded and prolonged spawning season. The cohorts mix extensively on the fishing grounds and probably comprise a single genetic stock. 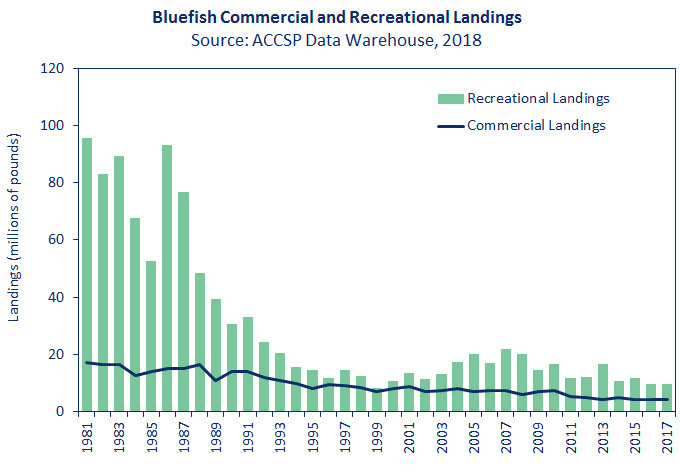 Bluefish are predominantly a recreational fishery, with recreational harvest accounting for approximately 72% of total removals in recent years. As bluefish migrate seasonally up and down the Atlantic coast, anglers from Maine to Florida target these voracious predators near inlets, shoals, and rips, where they come to feed on large schools of bait. Since reaching a low of 8.3 million pounds in 1999, recreational harvest has averaged approximately 13.9 million pounds annually. In 2017, anglers harvested 9.52 million pounds, representing a less than a 1% decrease by weight, but a 32% decrease in number of fish from 2016. Bluefish recreational discards have averaged approximately two thirds of the total catch in numbers of fish since 2007. Commercial landings decreased from 16.5 million pounds in 1981 to 7.3 million pounds in 1999. Since a state-specific quota system was implemented in 2000, commercial landings have averaged around 6.3 million pounds annually. In 2017, commercial landings were 4.13 million pounds, the majority coming from North Carolina, Rhode Island, and New York. 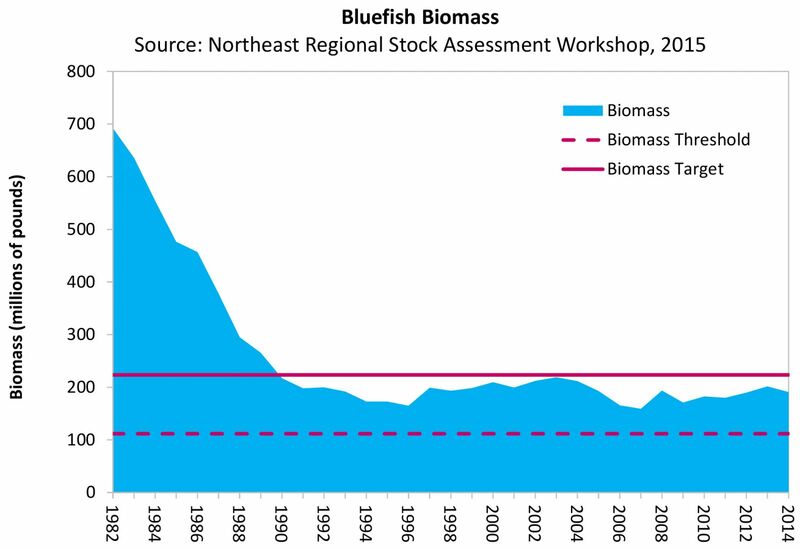 Based on the 2015 benchmark stock assessment and peer review conducted by the Northeast Regional Stock Assessment Workshop, bluefish are not overfished and not experiencing overfishing relative to the new biological reference points defined in the assessment. Though the assessment indicated bluefish are neither experiencing overfishing nor considered overfished, the assessment indicates lower biomass estimates and reference points relative to the previous assessment. Spawning stock biomass (SSB) in 2014 was estimated to be 191 million pounds, which is less than the SSB target (223 million pounds) but greater than the SSB threshold (112 million pounds). Fishing mortality (F) in 2014 was estimated to be 0.157, below the F threshold (FMSY PROXY= F35%SPR =0.19). An operational assessment is scheduled for 2019. Bluefish is managed under Amendment 1 to the Fishery Management Plan for the Bluefish Fishery and Addendum I. The Commission and Mid-Atlantic Fishery Management Council approved Amendment 1 to the FMP in 1998, which allocates 83% of the resource to recreational fisheries and 17% to commercial fisheries. However, the commercial quota can be increased up to 10.5 million pounds if the recreational fishery is projected to not land its entire allocation for the upcoming year. The commercial fishery is controlled through state-by-state quotas based on historic landings from 1981-1989, while the recreational fishery is managed using a 15 fish bag limit. A coastwide biological sampling program to improve the quantity and quality of information used in future bluefish stock assessments was approved and implemented in 2012 through Addendum I. A 2013 review of the inaugural biological sampling program found the geographic range, distribution of sampling times, and program design are effectively capturing age data. As a result of the provisions of Addendum I, the Commission and the states were able to significantly increase the amount of age data used in the 2015 benchmark assessment, resulting in improved age-length keys and catch-at-age data compared to the last benchmark assessment. Each year, typically in August, the Commission and Council meet jointly to review fishery specifications and formalize commercial and recreational catch limits and other management measures. The 2018 specifications include a recreational harvest limit of 11.58 million pounds and a commercial quota of 7.24 million pounds. The preliminary 2019 specifications include a recreational harvest limit of 11.62 million pounds and a commercial quota of 7.71 million pounds, but will likely change following the release of the 2018 final Marine Recreational Information Program harvest estimates. In June 2018, the Board and Council released for public comment a scoping and public information document for a new amendment to the Bluefish FMP, to solicit input on issues to include in the amendment, including revision of the FMP goals and objectives, allocations between sectors and states, and the quota transfer process.